Mono County is an impressive slice of habitats east of the Sierran Divide. It include the east slope of the Sierra Nevada to the crest, and then a whole series of habitats to the east: isolated mountain ranges, sagebrush plains, rich riparian stretches, and the world-famous Mono Lake. "Save Mono Lake!" was a primary environmental rallying cry in the 1970s and 1980s, a staggering effort that succeeded in doing just that through public education and awareness and an important legal case decided by the California Supreme Court. Mono Lake hosts massive numbers of migrants in season, and islets in the lake hold huge colonies of breeding California Gulls. 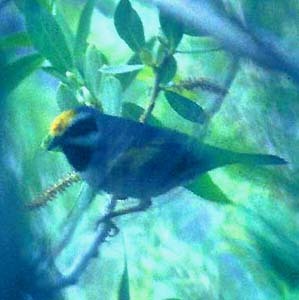 There are many vagrants traps scattered throughout the county, and perhaps none has seen more rarities that Oasis Ranch in the extreme southeastern corner. Mono County was created in 1861 out of what had been parts of Fresno and Calaveras counties; the county seat is Bridgeport (the only town of any size) which is adjacent to Bridgeport Reservoir, yet another good birding spot, especially for waterfowl in winter. Crowley Lake at Mono's southern end has a famed Sage Grouse lek near its shores. County birding statistics and links are on Joe Morlan's site. David Gaines' 1988 masterpiece, Birds of Yosemite and the East Slope, covers the status & distribution of birds in the Mono Basin. 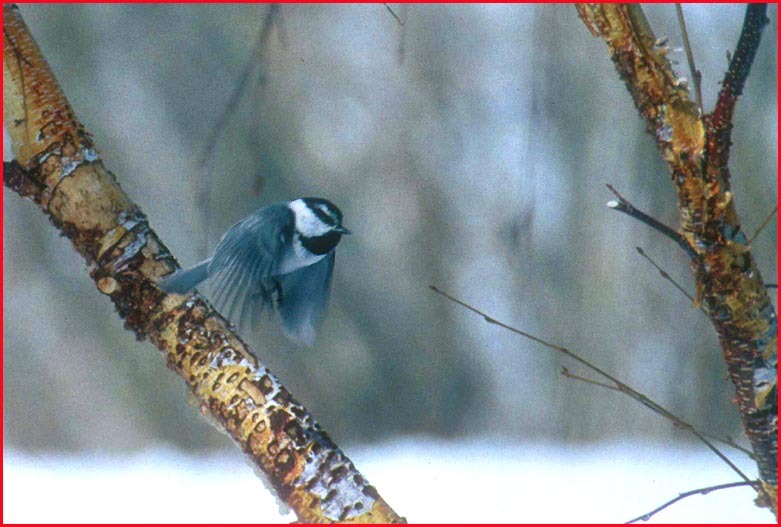 For Mono County the top shot is a Mountain Chickadee captured in flight, taking off from an aspen branch against a snowy background. It was an almost entirely accidental photo but I am rather pleased with the composition. Mono is really beautiful country, and I've had a lot of great times there. When I was 19, I spent a summer working for the county parks department there. I've been back throughout the seasons. 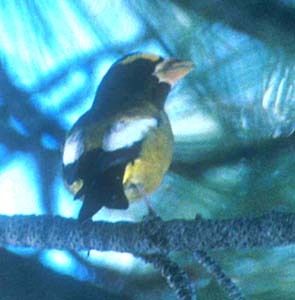 The Evening Grosbeak (below left) was also in winter (19 Feb 1995) but the Golden-winged Warbler (below right) was a late spring vagrant at Oasis Ranch in the extreme southeastern corner of the county (23 May 1987). Oasis was one of the 'regular' stops on the Death Valley birding circuit that so many of us did in the 1970s and 1980s. There are many superb views in Mono County. Mono Lake (upper photo, below; 1 Apr 2005) is an everchanging gem. Crowley Lake (bottom photo) has very distinct seasons: this shot is from winter (19 Feb 1995).